This is one of my personal dream cars. It is owned by Tom Holt, a co-worker of mine. 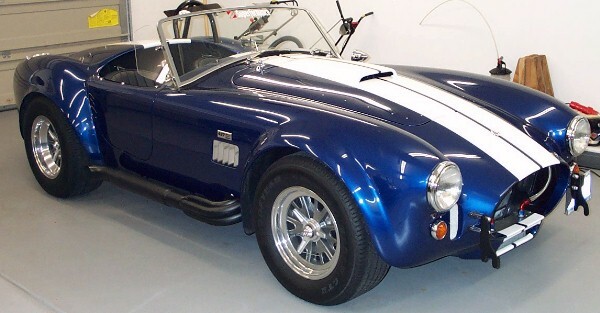 He bought it complete from Superformance in 2000. 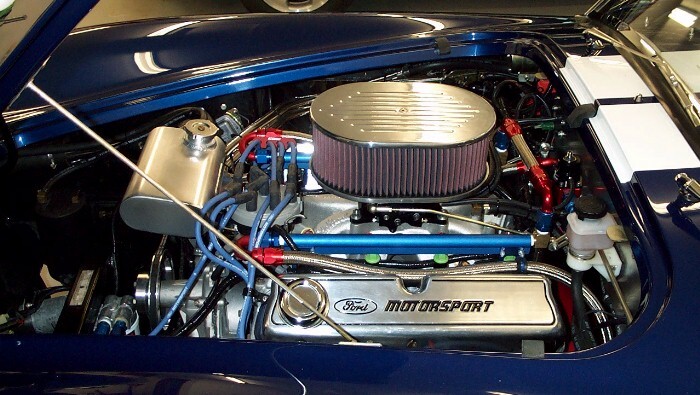 It came with a 530HP, Ford 408 (stroked 351W, bore = 4.030", stroke = 4.0"). Tom wanted the enhanced performance and driveability of EFI so we researched several options. At first we had considered supercharging as well but hood clearance was a big problem. Perhaps we will revisit that later. So we decided to install digital fuel injection with timing control to replace the carb and distributor. Tom started by installing the EFI fuel system. That required an EFI pump and the addition of a return line to the tank. He used an Aeromotive 1000HP fuel pump and all braided AN lines. We decided to go with the latest model of Accel DFI digital engine management. This system has full fuel and spark control as well as the ability to control nitrous, engine fans, shift light, and some other goodies. The system was intended for installation in a Mustang so the wiring harness for the DFI had to be modified for this application. The passengers sidepipe had to be modified to install the HEGO sensor too. We used an Accufab progressive throttle body with 4 throttle plates (1250CFM). This gave room for an air filter twice the height of the original. Setting up the DFI without a dyno has had it's challenges. There are tons of maps and calibrations for just about everything. You start by entering the basic parameters for your engine such as displacement, rpm ranges, ignition type, injector size, and so forth. Then you need to develop the volumetric efficiency (VE) tables. The CalMap software gives you help here. They ask for bore, stroke, cam parameters, and so forth and from this the program estimates what the VE table should look like and generates it for you. There are also a few handy tools in the software to help out fine tuning. For instance, there is a fueling analysis tool that will take the data from a data log file and analyze the volumetric efficiency (VE) maps based on O2 sensor readings. Some of the calibrations are not real intuitive. For instance, the software actually calculates how much fuel sticks to the walls of the ports during injection, and how much of that fuel is pulled back into the intake air stream during the intake stroke. There is really no guidance in setting this up other than the sample calibration file has some numbers pre entered. There are so many calibrations to set up, it just takes time, patience, logic, experience with engines, and perhaps some luck to get it right. Here is the global calibration setup file for those attempting the same thing: cobra.ecm (last updated 10-05-2002). I will try to keep this file replaced with the latest as this project continues. Right now, it is getting close but we still have bugs to work out of it. We used 10 degrees of initial timing (at the distributor) so the advance maps are showing advance over that 10 degrees. For instance, 17 degrees in the map is actually 27 degrees total. We finally got to the dyno October 5th. We made 15 back-to-back runs in 2 hours. It was a nice 70F degree day with a dewpoint around 42F. We started with the desired AF maps all set at 13.5:1 so we could tune the VE maps. Once we got the VE maps right, we played with AF ratio and timing. The car actually liked the AF ratio almost 14:1. Richer resulted in a power loss. We tried some minor changes to the timing map but we had that pretty close to begin with since we copied the curve that was in the old distributor. 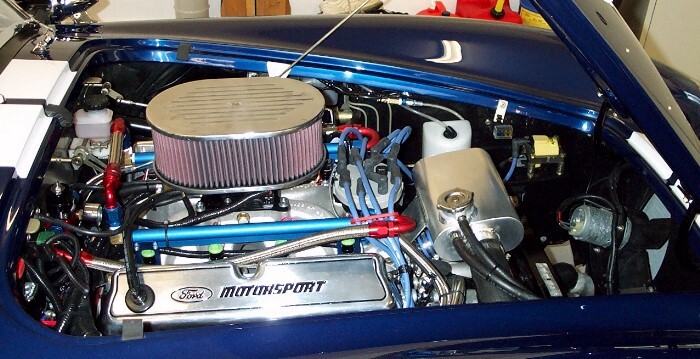 The dyno tuning resulted in about 30 more Horsepower. Here is the final curve. We were only 5HP shy or 400 at the wheels. The torque was very impressive with a 421ft*lbs peak, and it has over 400ft*lbs available from well below 3000rpm to 5000rpm. 6-2007 update: We have made several changes in the last year. It turns out the header gaskets were incorrect. They had factory square (and very small) ports but the heads and headers had large ports. This was creating a big exhaust restriction explaining the torque drop as engine speed increased. We replaced the gaskets with the correct ones. At the same time we replaced the restrictive mufflers with larger ones. We upgraded the ECU with the latest software and we installed a wide band O2 sensor so we could run closed loop all the time. We retuned the engine too. We have not been back to the dyno to verify the results but seat-of-the-pants there were good gains. Here is the new ECM file. We also had to change the transmission to an AOD (for other reasons). 8-25-2007. Minor cal changes to improve driveability. Latest file.